It’s rare that we see a movie that has a true sense of timelessness. Oftentimes, we have movies that aren’t even that old, such as 1995’s GoldenEye, which feel hopelessly dated in 2013. And then we have Breakfast at Tiffany’s, the romantic comedy in which writer Paul Varjak (George Peppard, aka that guy from The A-Team) meets the girl next door, Holly Golightly (Audrey Hepburn). It doesn’t take long for Paul to realize nothing is as it seems with Holly, and her pursuit of rich boyfriends. Breakfast at Tiffany’s is a movie with very minimal plot, and thus allows itself to be completely character driven. Not a single scene is wasted in developing Paul or Holly. Other characters come and go, but they all have lasting ramifications on the relationship between Paul and Holly. What I really liked about the movie was its subtlety, which was in large part due to Blake Edwards’ direction. The scene that comes to mind is when Paul first rang the doorbell as Holly lay in bed when the two met for the first time. Holly simply twitched her shoulder to knock off her cat as it tried to wake her up, which was an example of Edwards not using any more movement than he needed to get the point of the scene across. Later on, Edwards shows us a party that isn’t too far off from what I experienced as an undergraduate at Cornell University, complete with pretentious drunks. The party scene was simultaneously chaotic and legitimately funny, quite unlike anything that happened in the movie that shall not be named. Edwards just used some of the subtle slapstick he would become famous for with his work with the Pink Panther movies featuring Peter Sellers (I’m sorry, Son of the Pink Panther does NOT count). What I liked about Breakfast at Tiffany’s most was that it was simply the most human movie I have seen in a very long time. Characters felt emotions that actually seemed natural. Paul’s attempts to reign in Holly is a story I’m all too familiar with having encountered something similar in real life. Not once did I feel like the movie was trying to manipulate me. While it was a romantic comedy and not a wartime drama, it succeeded in eliciting emotional responses in very much the same way as Grave of the Fireflies, and quite unlike that other movie that shall not be named. 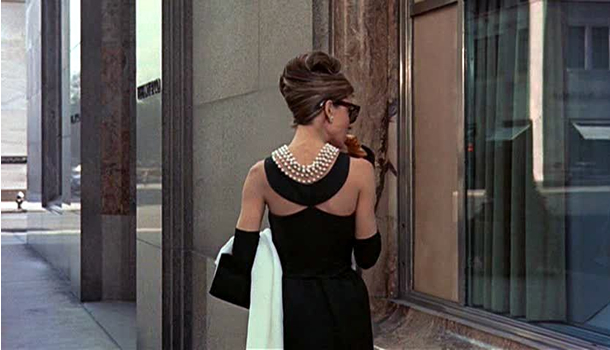 In general, Breakfast at Tiffany’s is the best boy-meets-girl movie I have seen in a while. having done right every single thing that The Perks of Being a Wallflower did wrong.